Ashley Woodson Bailey has always been drawn to flowers and considers them her love language. 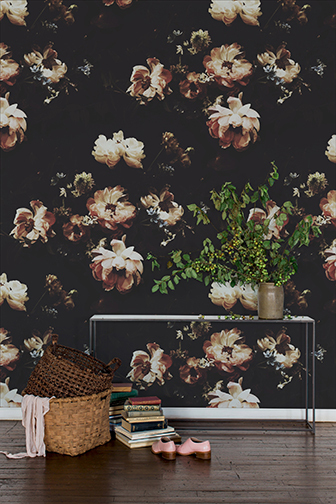 This past year, the Atlanta-based floral designer-turned-photographer’s ethereal prints have been transformed into large-scale wallpaper and soon they will also be used in a clothing line. 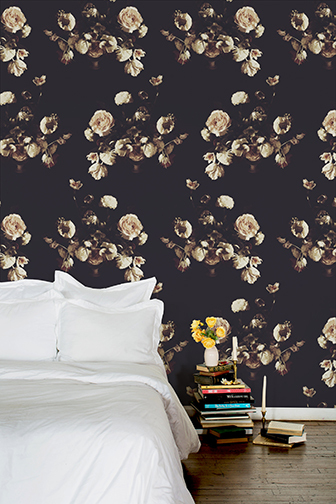 Rest assured, a Bailey wallpaper will transform any space from ho hum to wow without any stress on your part. 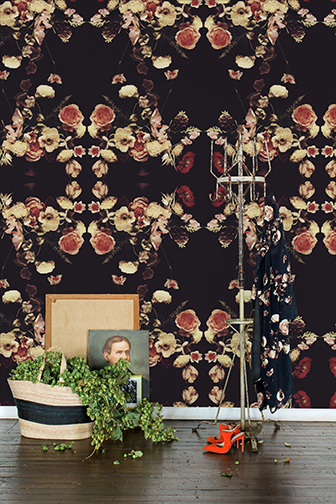 Try it on just one wall or if you can’t quite commit to the wallpaper, then consider a Bailey limited edition print—either will add a dose of drama to any room. Bailey’s first wallpaper collection and her prints are sold through her website, ashleywoodsonbailey.com. Her capsule clothing collection will be released by the end of the year and will be sold through her website as well. 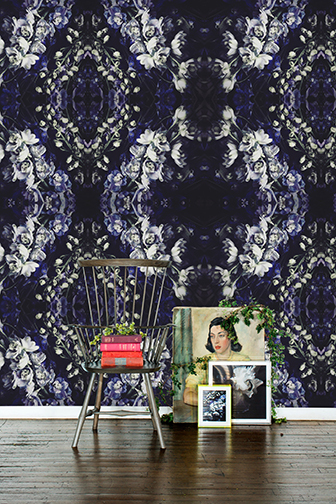 She debuts a new wallpaper collection this October. Bailey talks about how she started her career, how she got to where she is now, and her overall inspiration for her current designs. Flower: Before you started your successful photography business, you were actually a floral designer. How did you get your start? Bailey: When I was young, I lived in South Texas, and I was a debutante, which is comical because that’s not really my personality. I was throwing a deb party, and I wanted this really plain space transformed into A Midsummer Night’s Dream. So we brought florists to my tiny hometown, and that’s when I realized you can actually do flowers as a job. I just loved watching the whole process happen. I’ve worked with flowers in Dallas, Houston, New York, Savannah, and back to Texas in Austin. Then my husband and I were in this really terrible car accident, and I broke my back. And as you know, flowers are really difficult to do—you use your back for every single thing, and it’s very labor intensive. When the doctors told me that I wouldn’t be able to do flowers in the same way, I was mad and thought they were crazy, but after trying a couple of weddings, I realized the doctors were correct. So at age 43, I started taking pictures while still in my back brace. Using my iPhone, I would photograph flowers that people would bring me. I was just doing it because I was going stir crazy, and I like to be busy! My family and I moved to Atlanta, and that’s when I started posting my photography on Instagram. People would say, “Oh it’s so pretty! Can I buy it?” and I thought they were crazy because I never thought about selling any of them. I began printing them for myself to make sure they weren’t a big blurry, pixilated mess. And, they were actually quite beautiful. I launched the business in March 2014, and it all occurred from this really awful event that now, in a very strange way, I’m very grateful because I love what I do. When you began taking photographs, how did you come by your trademark look? I was an art history major in college, so when I started, I was very influenced by all things art and fashion. I’ve always loved the Dutch masters, and I really wanted to emulate that feeling in my photography. Also when I started, I was in a difficult place mentally and physically, and I gravitated to this dark, mysterious look. While my outlook is a lot brighter now, I’m still attracted to that deep palette with muted colors. What’s the creative process like when you’re about to take a new photograph? Do you go to the market, pick out flowers, and go from there? It depends on the season and even the day of the week. I go to Cut Flowers in Atlanta, and normally I call my guy, Scott. I’ll say, “What do you have? Do you have something special hidden in the back for me?” It’s great because I don’t have any rules or any template I have to follow. If I were creating a sample arrangement for a bride, I have to do what she wants. But for me, I start by seeking out what is the most beautiful flower that day, and then I’ll work around that flower. When did you start turning your photography into wallpaper and what brought on that decision? A while ago, I traveled to Australia for work. 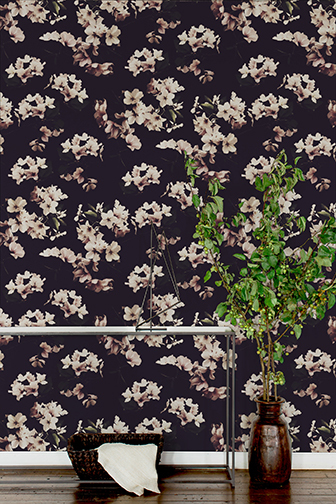 I was teaching a class over there, and I put a picture up in my presentation and mentioned that I was thinking about wallpaper, but I hadn’t done anything serious about it. This girl came up to me after class, and she said she makes wallpaper for a living. She’s a wizard with pattern. I will create an arrangement, photograph it, send her the picture, and she’ll turn it into this amazing print. I launched it last September, and it’s been going great. I can tell you that 9 out of 10 of my sales are the Dutch Love pattern. Overall, I’ve never had a plan in this business, but I’m starting to understand it better and enjoy the world of interiors more. It wasn’t my intention—I just started taking pictures of flowers and making prints for people to buy, and it’s becoming something much more. Tell us a little about your capsule collection. How did that come about? You have already had one collection partnered with Brooke Atwood, so how is this something different? The difference is that I did one image with Brooke to make a collection in December. It was with my print Creamy. It was basically made-to-order styles printed on beautiful silk fabric and people responded really well. Brooke is an amazing designer based in Atlanta and an old friend, so it was fun to work together on that. For my capsule collection, I wanted to do this because I previously partnered with a company based in Australia called Hubble and Duke, and they did this cute little kids line. They were so beautiful, that I decided that I wanted to make clothes for women. Follow our Wallpaper pinboard on Pinterest! 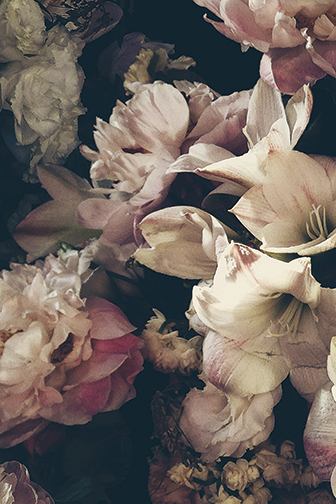 Learn how to arrange flowers from designers and tastemakers in the floral and event world. From crafting centerpieces, wreaths, garlands to bouquets and boutonnieres, enjoy dozens of step-by-step guides prepared by the floral experts featured in FLOWER magazine. Enjoy the most inspiring collection of flower arrangements, floral arrangement ideas, and step-by-step guides prepared by the experts featured in FLOWER magazine. Learn about centerpieces and bouquets, and how to make beautiful flower arrangements from designers and tastemakers in the floral and event world. Learn about spring centerpieces and bouquets, and how to make beautiful spring flower arrangements from designers and tastemakers in the floral and event world. Learn about summer centerpieces and bouquets, and how to make beautiful summer flower arrangements from designers and tastemakers in the floral and event world. Learn about autumn centerpieces and bouquets, and how to make beautiful fall flower arrangements from designers and tastemakers in the floral and event world. Learn about wintery centerpieces and bouquets and how to make beautiful winter flower arrangements from designers and tastemakers in the floral and event world. Learn about Christmas centerpieces, garlands, and wreaths and how to make beautiful Christmas flower arrangements from designers and tastemakers in the floral and event world. Learn about wedding centerpieces and bouquets and how to make beautiful wedding flower arrangements from designers and tastemakers in the floral and event world. Enjoy tips, guides, advice and inspiration from some of the world’s foremost floral designers and tastemakers. You’ll find scores of fantastic designs and arrangements prepared by the experts featured in FLOWER magazine.